CyberLink PhotoDirector is kind of a sleeper in the Mac pantheon of desktop image editors. It competes with Apple Photos, Adobe Photoshop Elements, Pixelmator, Luminar, and other consumer imagers. 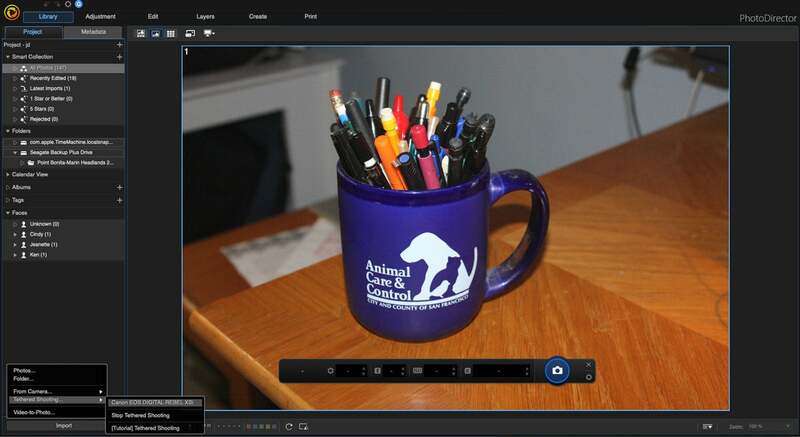 CyberLink is mostly associated with Windows, and PhotoDirector is the only cross platform item in the company’s suite of multimedia prosumer apps. 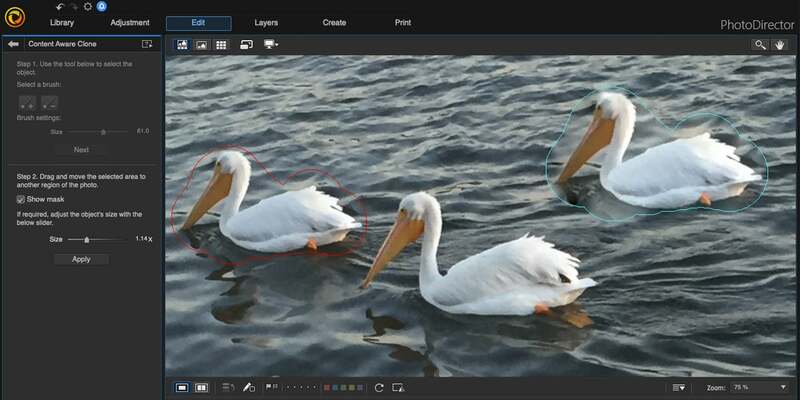 Like many of CyberLink’s Windows apps, PhotoDirector 10 has its own brand of sizzle that may prove appealing to Mac users, especially those interested in turning their photos into works of art. 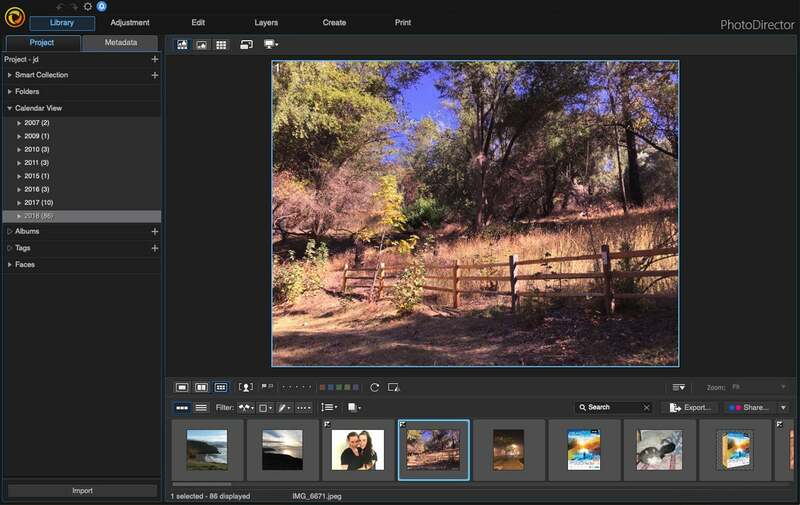 The latest version of PhotoDirector offers multiple new layer features, keystone correction, content aware clone, the ability to separate imported GIFs into individual frames for multi-exposure or multi-sequence images, and artificial intelligence-based tricks, as well as tethered shooting, soft proofing, template packs, and a new calendar view. That’s in addition to fun and advanced features from previous versions, such as 360-degree photo handling, cinemagraph creation, multi-exposure images, face and body beautifiers, video-to-photo face swapping, and more. Just one click can correct keystone distortion. A new Calendar view sorts photos by year. Import an animated GIF as separate frames. PhotoDirector 10 Ultra also includes 25GB of space on the CyberLink Cloud so you can store, access, and work on your images from anywhere you wish. One-click photo presets lend easy-to-use creative variations to your photos, letting you automatically choose among HDR, Black & White, and Split Tone looks, as well as styles designed specifically for portraits and landscapes. PhotoDirector 10 comes with a number of built-in presets, though tons of additional presets are available for individual download from the company’s DirectorZone website and you can create your own presets. While you can’t adjust the presets from the preset pane, you can switch to the Manual pane, which contains the needed controls. You can create your own presets based on existing ones. Everyone remembers Prisma. It was part of a wave of server-based AI apps that mesmerized viewers by transforming photos into specific and recognizable artistic styles. That concept lives to see another day in PhotoDirector 10. AI Style Transfer uses deep learning to style your photo. 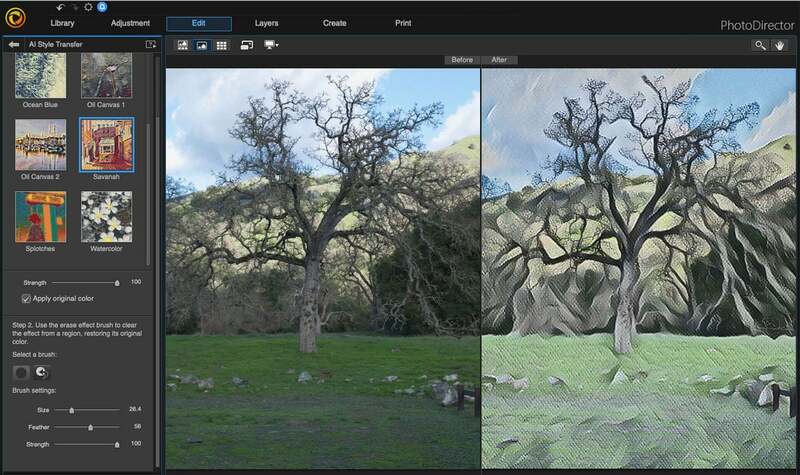 Like Prisma, CyberLink’s AI Style Plugin uses deep learning to produce brush strokes and color tones of artistic styles that alter photos on the pixel level as opposed to applying external filters. CyberLink’s AI Style Packs for PhotoDirector are mostly paid add-ons that require separate download and licenses, but there are a number of free samples built into the program. Tethered shooting is a handy studio technique that lets you attach your camera to the computer as you shoot, allowing you to tweak shutter speed, aperture, white balance, ISO as well as trip the shutter. I was able to link my camera to the app and could see the controls change dynamically on the camera readout in real time as I altered them on-screen, but I could not get the visual preview to appear on the screen before the shot. That was disappointing, but the reason is that the feature was developed using the camera companies’ SDK, which does not enable a live screen preview within the app. Moreover, this feature works only with certain Nikon and Canon cameras. If you are looking forward to using this feature, make sure your camera is supported via the list CyberLink has published. Attach your Nikon or Canon camera to your Mac to control various settings from within the program. Soft proofing lets you view simulated printer output on your monitor and includes a gamut warning signaling color range issues before you start wasting ink. While I was able to access the program’s built-in color profiles, my own printer failed to show up as a profile I could select, even though it showed up in the regular printer dialog. 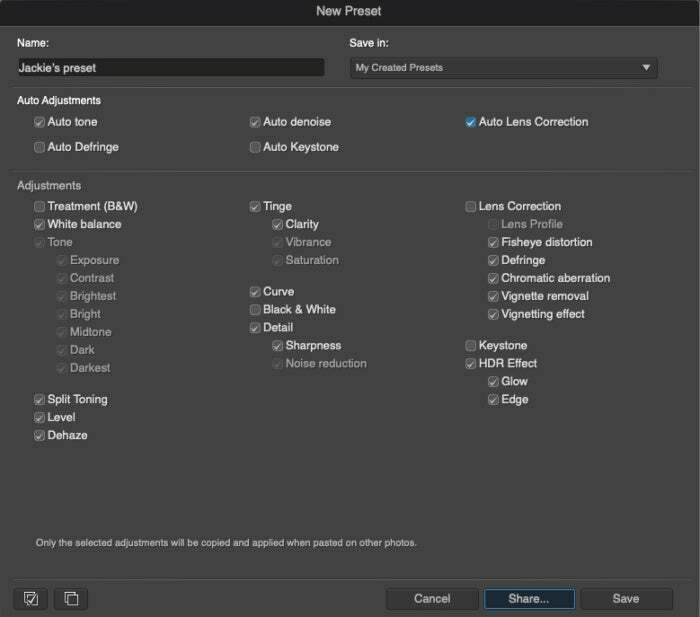 Adobe popularized content awareness with its Photoshop and Photoshop Elements algorithms, while Pixelmator and others also offer this easy way to remove unwanted objects from a scene without destroying the integrity of your image. 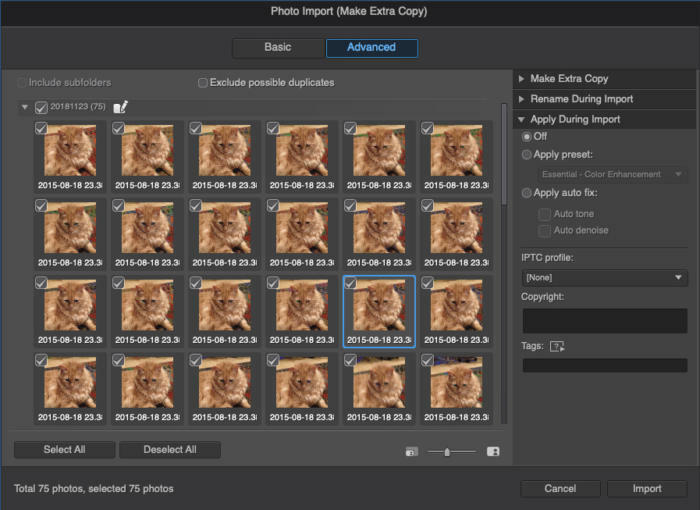 With PhotoDirector, you can now duplicate, or move objects or people within photos. I found this feature hit or miss, with busier background fills less accurate than simpler ones. I also found the performance in these operations somewhat slow on my mid-2013 MacBook Air running the latest macOS. Content aware clone is one of PhotoDirector’s new content aware features. You can have as many pelicans as you want. 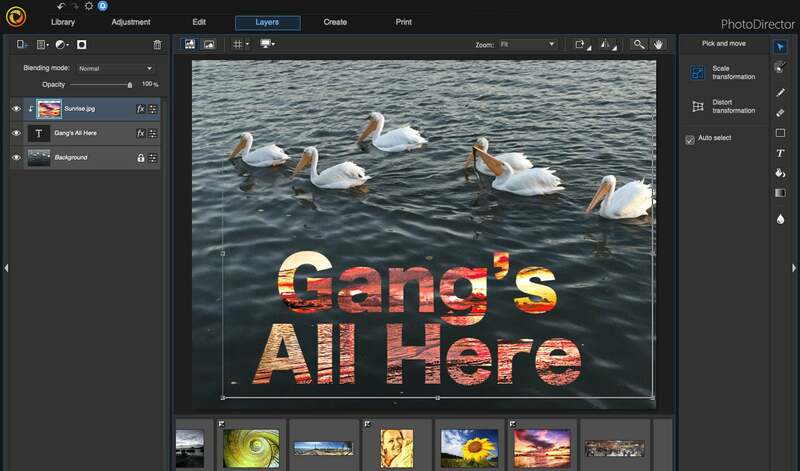 Layer editing with Express Layer Templates offers the flexibility to create unique compositions by combining images, text and graphics with blending modes and masks. PhotoDirector 10 provides built-in layer-based layouts for consumer-oriented web pages, framed photos, greeting cards, and memes, while special effects like grunge, light leaks, scratch and lens flare give family photographers tools to make unique compositions for special occasions. Express Layer Templates add all kinds of layer-based shenanigans to your photos, and you are free to hide and show any layer you want. Clipping Paths let you stuff images into text. PhotoDirector 10 also introduces clipping masks, layer grouping, and the ability to add new empty layers to projects, all of which are fairly standard features for most popular image editors catering to enthusiasts. These features worked as expected. 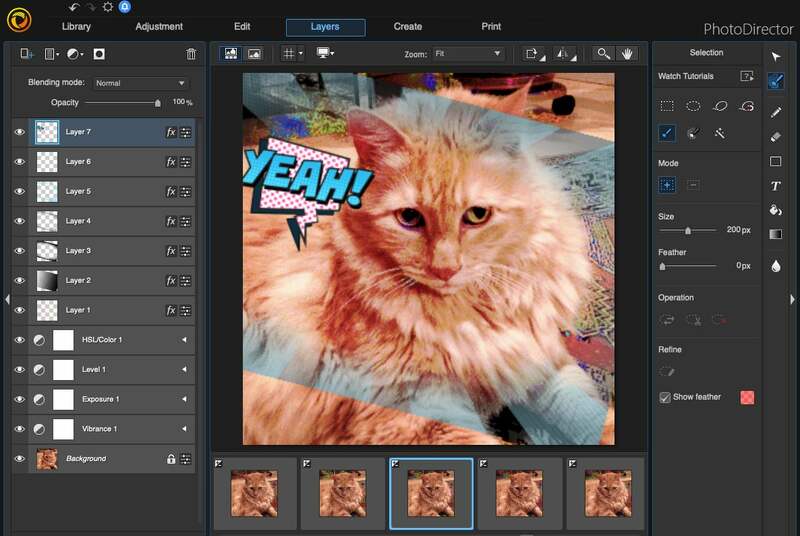 Adjustment layers, a common photo editing feature for non-destructive editing, got added to version 10. 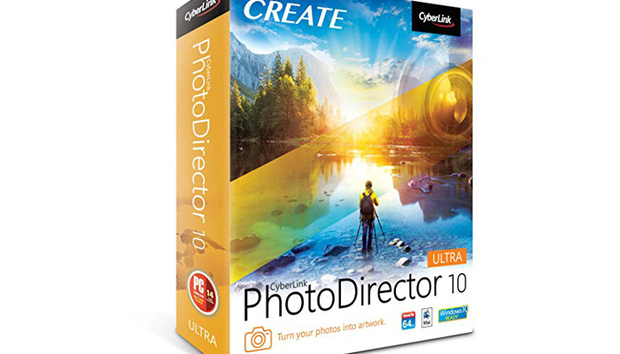 Several features distinguish CyberLink PhotoDirector 10 Ultra from its competitors, offering a fun, intriguing take on various advanced and novel photographic techniques. While this version catches up to other popular image editors in its approach to layers and clipping masks, the ability to apply AI styles, and do tethered shooting and soft proofing present an alternate angle on consumer photography. That said, certain features did not work as expected or were not as useful as I had hoped, and performance in some computational operations could take awhile. A trial version is available, allowing you to make sure you’re getting everything you want from the app before forking over your cash. « AWS gets serious about hybrid cloud with Outposts, so who is it for?